Lumineers are a brand of porcelain veneers that have been heavily marketed. They are made by Den-Mat, a dental products company in California. 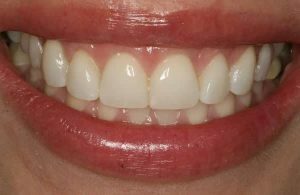 Den-Mat has done a lot of good in helping people understand how porcelain veneers can improve their smiles. But there are some misconceptions that have been created which we would like to clear up. Many people think that Lumineers are unique. In reality, they are only one brand of porcelain veneers. They do have greater strength than some other brands, so they can be made thinner. But other brands are just as strong and can be made just as thin. DURAthin and Vivaneers are two other brands that have these characteristics. Some people have a misconception about Lumineers certification. When a dentist pays a fee to Den-Mat and attends a Lumineers course, he or she is granted certification. But there is no test required to get this certification. And any properly trained cosmetic dentist knows how to place porcelain veneers of any brand. There is much training in smile design, color, art, and technique that the Lumineers course doesn’t address. So be careful not to put too much emphasis on this certification. Den-Mat requires that all Lumineers be made at their large dental laboratory in California. Work from this laboratory has been criticized by cosmetic dentists as not being very artistic. Common criticisms are that the teeth are made too long and too bulky and that the coloration is too opaque, flat-looking, and not lifelike. Dr. Newkirk does a lot of work with ultra-thin veneers, but he doesn’t like the Lumineers brand. Instead, he has his own master ceramist who produces custom work and beautiful work for his patients. Let’s show you why he does that with photographs. The photographs below are a sample of work from the Lumineers laboratory. These photos were actually posted on the Lumineers website as a “case of the month” from December 2008, so they represent what the Lumineers company considers their very best work. But look closely at the results. Do you really think the “after” photograph is better? Expert cosmetic dentists have said that the teeth in the “after” photograph look too bulky and they make her face look fatter. What do you think? Remember the typical criticism of Lumineers: too bulky and too opaque. While at this magnification we can’t judge the opacity, we can tell that they are too bulky. By comparison, check photographs of Dr. Newkirk’s ultra-thin veneers below. 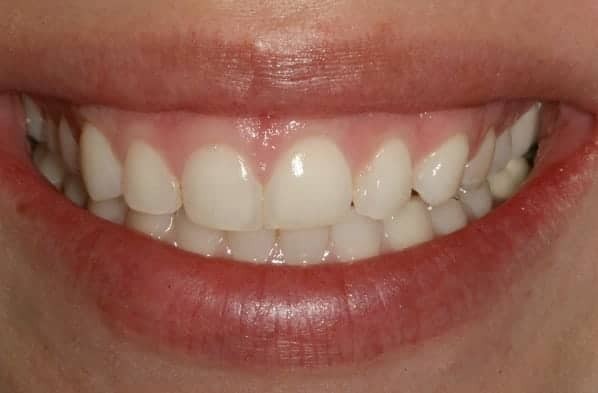 This patient wanted more even, nicely shaped teeth. She did not want a color change, but wanted them to look as natural as possible. Notice how successfully Dr. Newkirk’s master ceramist was able to create a natural-looking smile. You would never know anything was done without seeing the “before” photograph. This is Dr. Newkirk’s idea of beautiful cosmetic dentistry – work that no one knows was done. You may also want to visit our smile gallery to see more of Dr. Newkirk’s work. He is known nationally and internationally for the beautiful smiles he creates.